Ann Hamilton is a talented Canadian Artist based out of Acton, Ontario. Working in watercolour she produces both original and limited edition paintings as well as graphic designs for the business community. 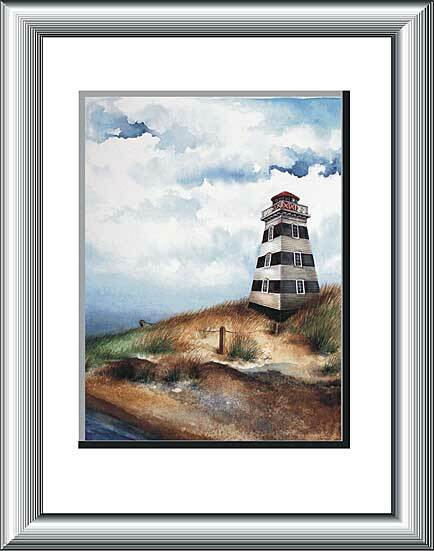 Ann has created limited edition series of prints of Hydro Lineman working on electrical poles and is currently producing her much awaited limited edition series on lighthouses. One of Society's most important trades - the hydro lineman, who in all types of weather and at all times of the day, ensures that our vital electrical power continues to flow. 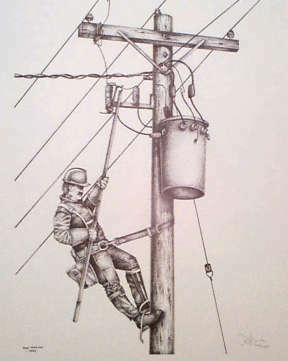 This is a series of two exceptional black and white prints showing the lineman, or powerline maintainer working on hydro poles using spurs and also working from a hydro bucket truck. Images of the prints and purchase information can be found at this webpage - BUY HERE. Ann is currently working on a highly anticipated watercolour series of lighthouse paintings. Beginning with two prints this series will show Ann's love for the scenic and lonely lighthouses which have called to sailors throughout the ages. Please join our growing mailing list for notification on the prints availability by sending us an email. 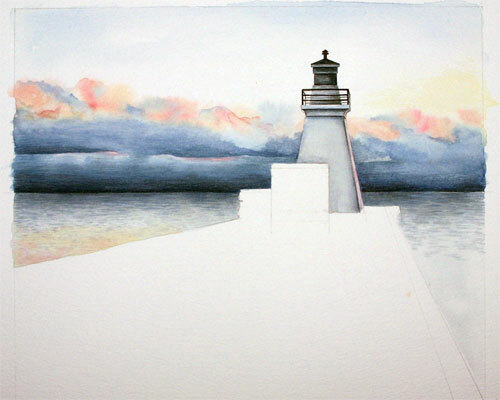 Ann has just started a watercolour painting of a light house located in Port Dover, Ontario. She has got some of the sky and lighthouse painted in this early stage of the art work. Click on the picture to see more stages of this painting. Pictures of wildlife are Ann's main subject - however she has been commissioned to paint a wide variety of subjects. Several of her works are available for review on this page. Most of the paintings can also be purchased as signed 8 x 10 inch colour reproductions for $35 US ($35 CDN) suitable for framing. Does not include mat, backing or shipping. Contact us for availability. 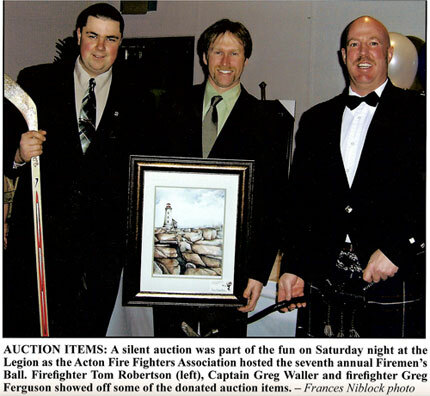 Ann provided a signed and framed reproduction of a lighthouse for the Acton Fire Fighters Association 2007 Firemen's Ball silent auction as seen in this Acton Tanner Newspaper photo by Francis Niblock. As a professional graphic designer graduated from the world renown art program at Sheridan College she has created a large body of art used in advertisements and business promotion. Includes Mat and backing (artwork is not framed). Price per one person portrait. For additional subjects in drawing add 30% to the cost. Add $15 US ($15 CDN) for shipping to US and Canada. Send a photograph of your subject, your requirements, the above noted fees and allow 3 weeks for drawing and approximately 10 days for shipping. Contact us for a no obligation quote on your design requirements. Digital artwork provided ready for printing. 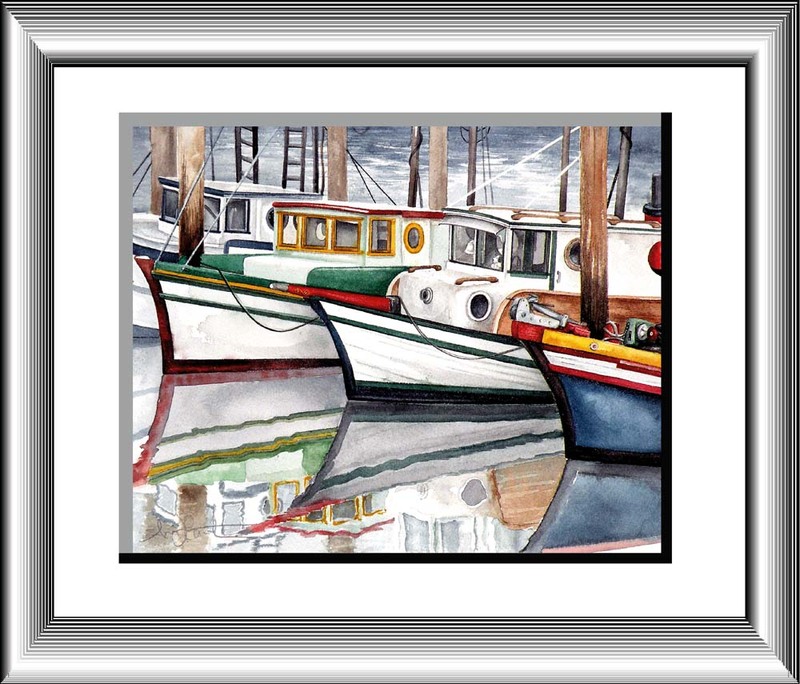 Let me create a custom original watercolour work of art based on your requirement (does not include portraits). Includes Mat and backing (artwork is not framed). Add $15 US ($15 CDN) for shipping to US and Canada. Send a photograph of your subject (if applicable), your requirements, the above noted fees and allow 4 to 8 weeks for painting and approximately 10 days for shipping. 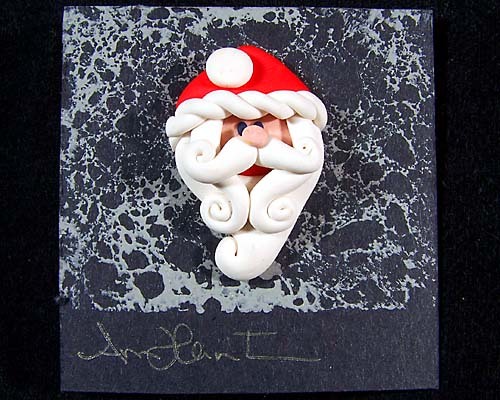 Ann has created a series of hand crafted, custom made pins that are sure to bring joy to anyone wearing the cute creations. Go to her pin page to look at the selection available. Ann Hamilton, 9 Church St E, Acton, Ontario, L7J 1K3. Other great Ann Hamilton merchandise - including shirts and coffee mugs featuring her paintings and drawings, can be purchase directly from my store on CafePress by clicking on the following link banner (www.cafepress.com/annhamilton).